You are here: Home / Articulation / Welcome to Kids Chatter’s Blog! Please have a look around our website to find information on what we do and how we can help your child. Kids go through so many developmental stages and sometimes they need a bit of help in areas that are difficult for them. Whether it be their clarity of speech, increasing their words and sentences, stuttering or reading and writing, we can help! We have a wonderful team of experienced speech pathologists who love doing what they do. Check out Our Team to meet our speechies and find out about us. On our website, you’ll also find information about how we do our assessments and our therapies. If you’re not sure whether or not your child needs our help, check out the “Our Therapies” pages where we have explained some of the warning signs you may recognise. If you have any questions or concerns, you can send us a message through our Contact Us page or give us a call. 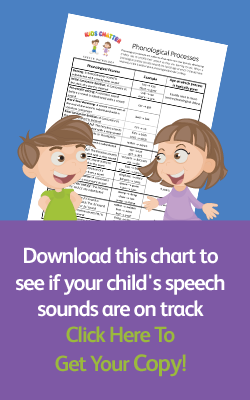 Make sure you sign up to our email list by downloading your free speech chart and get updates through our blog. We’ll be updating our blog regularly with information about what you can do to help your child, therapy tips, resources and so much more. And lastly, we love feedback. If there is anything you’d like more information about that we can put in our blog, let us know.